on Mean Angel right there. Cragginess (in his line, not his personality, I’m sure!). Grimaces. Swirly smoke. A willingness to tackle pretty much anything a writer throws at him. Comedy faces. Perhaps more than any other long-serving artist, having an old style (fully painted) and a new style (pen and ink cartooning)*. A very brief mid-period took in a couple of memorable episodes of Tales of Telguuth. Before Critchlow delivered his current signature style on a bunch of Dredds, and his major new creation for 2000AD, Lobster Random. I don’t have a full sense of the timescales involved, but I can well believe that this cartoony style was in fact Critchlow’s default setting. ** The painted work was purely a result of the fashion of the time. Yes, a post-Bisley fashion. Anyway, back to the beginning! 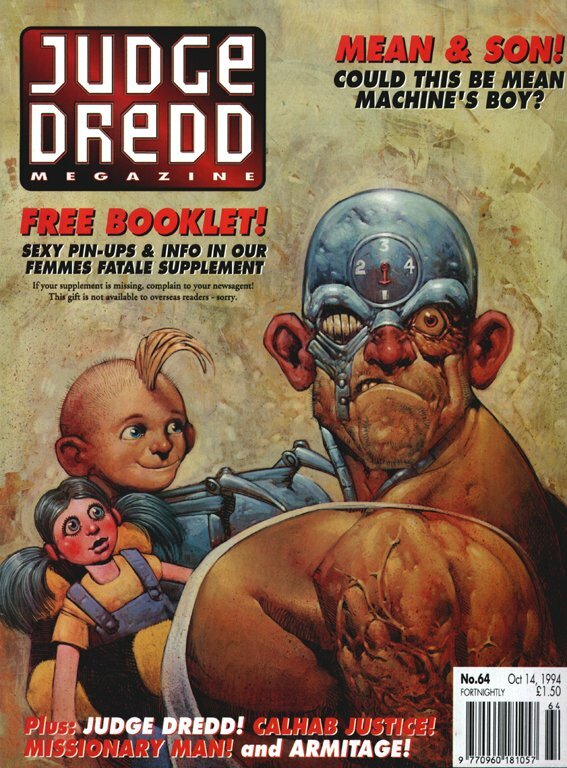 Critchlow got his first work with Pat Mills, a privilege and a challenge in equal measure. Nemesis & Deadlock required a deft tonal balance of occult styling mixed with straight up comedy. A painted Nemesis inherently meant losing some of the delightful detail that was so prominent on the original incarnation of the character. On the other hand, concocting a cast of colourful murder suspects was something Critchlow made look easy. Which one of these seven faces could hide guilt? WHICH ONE??!! And speaking of privilege, it’s pretty big deal that he was tapped to bring Flesh back to the Prog. A story I knew only in passing from reprints at the time, it remains perhaps the most fondly remembered original strips (from those readers who have been here since Prog 1, that is1). There’s the inherent hook of Cowboys vs Dinosaurs, coupled with the promise of gaping teeth and gory death. So when the story came back to the Prog, it was going to be something special, right? The murkiness here is only partly my fault! That damn brown period. Legend of Shamanna didn’t do Critchlow any favours. Frankly, it’s a weird story. Sure, there’s the fun central idea of a human raised to be a dinosaur, but ditching the cowboy angle meant the strip lost its weekly sense of fun. That said, my favourite parts of Critchlow’s work here were the panels showing campy/beefy construction worker-types wielding massive chainsaws. And then getting chomped, of course. His sneering suits and caring scientists provided some laughs, too. And he certainly delivered on the massive teeth and gory deaths. 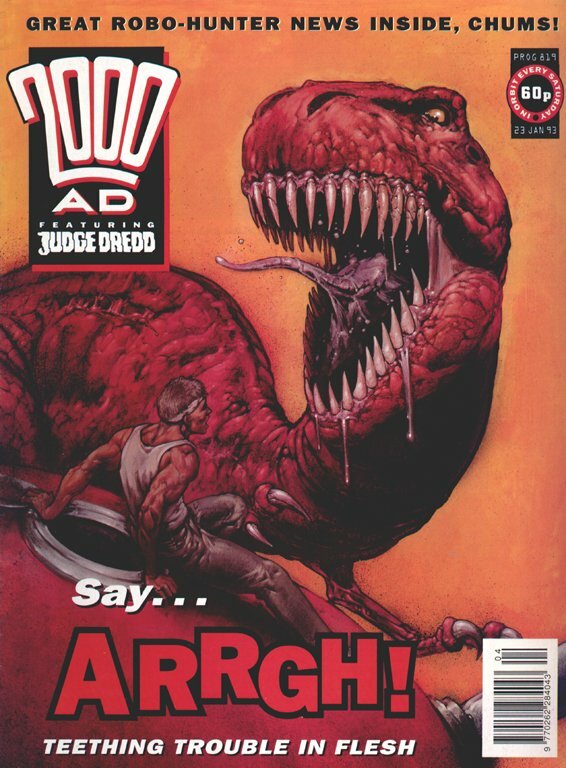 Like other comics in the 1990s, 2000AD was not averse to a little saliva strand action. At least here it's appropriate! 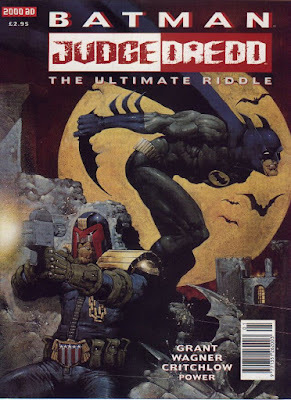 For me, a refinement in style began with Judge Dredd/Batman: the Ultimate Riddle. Bizarre cover design aside, there’s some fun on the inside, and his Dredd here is the most granite-hewn the big chin has ever been. Critchlow isn’t an old man (although hopefully he will be one day! ), but he certainly has a facility for rendering them. I’m surprised he hasn’t done more Dredd – it seems like he’s a regular Dredd artist but in fact he’s not produced all that many – it’s just that what he has worked on has been suitably memorable, from a revisit to the wolf judges of the Undercity to Mandroid II. And yes, this is where new-look Critchlow kicks in. Dredd's face has the same texture as the concrete walls. Splendid stuff! Almost instantly a reliable Dredd-drawer, Critchlow was then tapped to introduce Deputy Sinfield, later to become a uniquely malevolent Dredd villain. And, in perhaps the ultimate test, he had the job of tying together the epic of Trifecta. Obviously he was doing his own thing, but to an extent his task was to synthesize the work of Henry Flint, Simon Coleby and D’Israeli. Oh, and draw a city-sized spacecraft crash landing on Earth. Amazing. 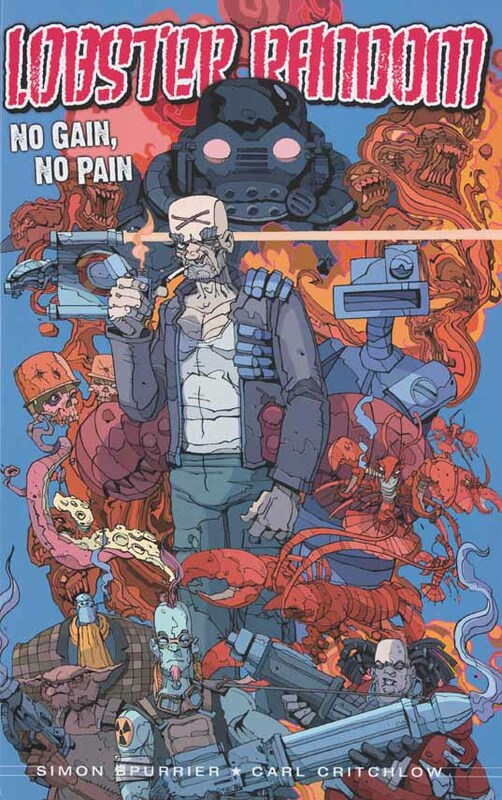 But I think its safe to say that for most readers, Critchlow’s name remains synonymous with his (to date) only series creation, Lobster Random. The inherent nature of the character and the ultra-convoluted plotting marks this as Spurrier’s idea, but Critchlow sure did bring it to life. The red, blue, orange colour scheme sets the tone perfectly. In the end, it’s Random’s expressions that make the story fun. He’s crabby by default, but also excitable, irascible, mean-tempered, rolly-eyed and, on occasion, delighted by a challenge. Even if said challenge involves torturing the untorturable. Not too many 2000AD characters get to fall in love. Now why hasn’t he been in the Prog lately, that’s what I want to know. 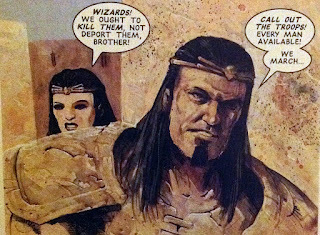 Too busy drawing Magic cards? Nemesis vs Deadlock: wait, arent they supposed tobe the same person, somehow? Can't bring myself to think that the murky Nemesis and Deadlock story is his early-period. To me that honour belongs to his White Dwarf Thrud pages - his painted stuff is mid and his modern style is latter.